We are now offering a stem injection service for the treatment of Japanese Knotweed. Japanese knotweed is a herbaceous perennial plant, that is highly resistant to frost, drought or extreme heat. It has a thick canopy during summer, which appears to die back in autumn, but the root system remains strong. It can sprout through very small cracks in concrete or tarmac, causing structural defects to roads pavements and buildings. It forms thick, dense colonies that completely shade out all other herbaceous species. 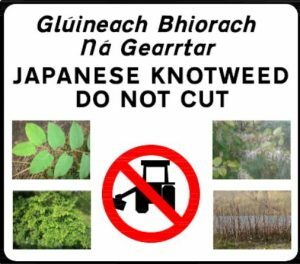 Cutting Japanese knotweed only contributes to its spread, and does nothing to harm it. The most effective eradication method is a carefully planned application of stem injections, where each individual stem is injected to that the herbicide can penetrate the roots. These treatments are repeated annually for a number of years, and supplemented by spraying in the later years of the treatment. david@dltreecare.com | 087 354 1185 | 086 820 6811 | Ladysbridge, Co. Cork. © 2019 David Law Tree Care & Training. All rights reserved.